Knee dislocations are rare injuries but are being seen with increasing frequency. These injuries are usually caused by high-energy mechanisms. Associated cerebral and visceral injuries are common. Neurovascular injury in the involved extremity can result in long-term disability. Failure to identify a popliteal artery vascular injury may lead to devastating complications. Nerve injury is also common in knee dislocations and can result in significant morbidity. The common peroneal nerve is the most frequently injured peripheral nerve. The incidence of deep venous thrombosis (DVT) in patients with a knee dislocation is unknown. However, many patients who sustain a knee dislocation fulfill Virchow’s triad for risk of DVT: endothelial injury, venous stasis from immobilization, and hypercoagulability associated with trauma. Following injury, many patients with knee dislocations are immobilized and kept non-weight bearing, all of which further predispose the patient to a DVT. Significant capsular disruption and fascial defects occur in knee dislocations. These capsular tears can predispose to fluid extravasation if arthroscopy is performed soon after the injury. Extravasation of arthroscopic fluid has the potential to cause a compartment syndrome. Superficial and deep wound infections can occur following surgical treatment of the dislocated knee. Many patients with knee dislocations have a severely traumatized soft tissue envelope around the knee. Excessive tension on the skin from an unreduced dislocation or from tight surgical wound closure can lead to skin necrosis. Arthrofibrosis is a common complication of treatment of multiligament knee injuries and is considered to occur in approximately 20% of postoperative KD patients. Previously, most knee dislocations were treated with cast immobilization. As surgical treatment of the multiligament knee has become more popular, arthrofibrosis still remains a common complication. Heterotopic ossification can further compound range of motion loss in these patients and has been shown to occur in several studies. 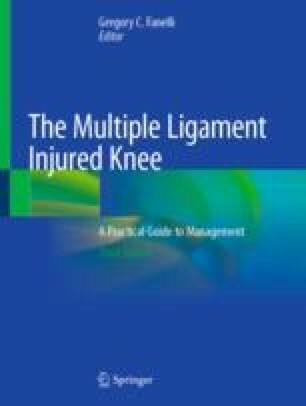 Recurrent or persistent instability can also occur following treatment of multiligament knee injuries. Factors that can affect the stability of the knee joint include the severity of the initial injury, type of treatment selected, quality of treatment performed, rehabilitation program, and any additional traumatic events. Chronic instability predisposes injured knees to further injuries, including the menisci and articular cartilage. Accelerated degenerative changes can occur following treatment of the dislocated knee. Ultra low-velocity injuries have a high risk of instability with non-operative management. Patients with multiligament injured knees present the surgeon with the difficult task of restoring stability to the knee without causing major complications. A thorough understanding of knee anatomy and biomechanics, combined with careful surgical planning and execution, can minimize the risk of serious complications. Careful postoperative follow-up is required to identify complications that can occur. Early recognition and prompt treatment will result in a satisfactory outcome in most patients.